The kids played with the dogs and jumped on the trampoline while the husband and I played cards on the patio. It was a great evening except for some uninvited guests. We were swatting mosquitoes, gnats, and other bugs away until I lit a bug repellent candle. Finally, we got some relief from our flying foes. I like burning candles with essential oils to naturally repel bugs, but I always ruin my candles because we don't burn them long enough. You should burn a candle one hour for each inch of diameter or it will start to tunnel in the middle. Eventually, you won't be able to light it because the melted wax will drown the wick. Sometimes I only need the candle for an hour. Sometimes we plan to be outside for the evening, but then something comes up and we have to leave or head inside. So I thought why not make a candle melt? They are easier to make than candles because you don't have to worry about using the right wick. I can burn one for 15 minutes or several hours, and I don't have to worry about ruining the candle. I wanted to use essential oils for my homemade bug repellent candle melt recipe because I wanted natural ingredients. 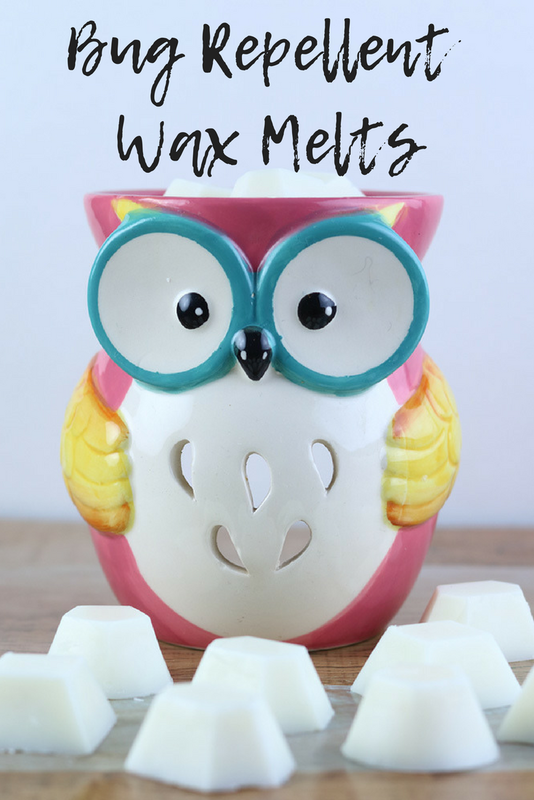 You can use one or more essential oils for your wax melts. This is perfect if you're on your patio or sitting in one area in your yard. If you need natural bug protection on the go, try this homemade insect repellent spray recipe. I use the Insect Repellent blend from Crafty Bubbles. It's preblended with 5 different oils, which makes it so easy to use because I can use just one bottle instead of several. I don't keep all of the oils that's in it on hand, so it helps eliminate clutter, too. Lemon eucalyptus is a proven natural bug repellent, so it's always my first choice to add to a blend. The Insect Repellent blend is 40 percent lemon eucalyptus. You can also use it alone or make your own insect repellent blend. It's also said to repel ticks. Lavender is best known for relaxation, but it's also a good oil for repelling bugs, including mosquitoes. It also helps repel moths, so it's a good oil to use in your bedroom if you store clothes in boxes. I use peppermint essential oils to repel spiders around my windows. You can also put a few drops on cotton balls and place them around your house if you have mice because it's said to deter rodents. Peppermint also has a clean smell, so it's a good oil to use in a spray. Basil naturally targets the larvae stage of insects, so it can control future bug growth. It's also effective on mosquitoes. Pine naturally repels mosquitoes. It can be an overwhelming scent for me, so I use it in small quantities. Vetiver has an earthy smell, and it's a great oil for stress relief and calming. It also helps repel bugs and mosquitoes. Lemongrass is a great natural mosquito repellent. It's closely related to citronella, and it works very similarly. Thyme is supposed to naturally repel mosquitoes. I used soy wax because it burns cleaner than paraffin wax. Soy wax is soft, so it doesn't shrink and pop out of the wax melter like paraffin does, but it's not too difficult to remove. I just use a butter knife to scrape it out. The soy wax that I had was for containers only, so I added some stearic acid to make it harder. I prefer to use a silicone mold to make mine so they are easier to unmold. You can use any mold or even reuse the plastic container from wax melts that you bought. I used the Nerdy Nummies Gem Shapes mold. If you make this a lot, you can even reuse your wax. Pop your wax out and put in a bag or container. When you have enough to remelt, just follow the directions to remelt. Before we get on to the measurements, I want to say that you can scale this up or down. You'll need 5 mL of essential oils per pound of soy wax. Five mL of essential oils is approximate equal to 85 drops or 1 teaspoon. What if you add too much essential oil? That depends on how much extra you add. If you use a few extra drops, you should be fine. 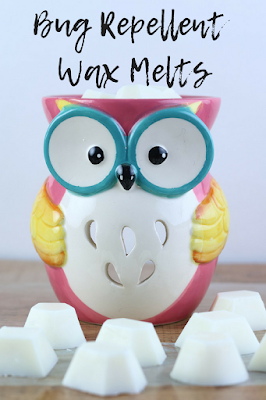 If you add double what you need, then the wax melt may seep out oils and make a mess. This recipe is more forgiving than if you were to make candles. If you add too much oil in a candle, it may not burn well because of the wick. With no wick, there's no problem with that. Weigh the wax flakes using a digital scale. Place in a double boiler and add the stearic acid. Heat until melted. Always use a double boiler to heat wax. Never place on direct heat or microwave to melt. If you don't have a double boiler, I use a Pyrex measuring cup set on a canning ring inside of a pan of water. When the wax is melted, carefully remove from heat. Use hot pads because the double boiler will be hot. Let cool to 185 degrees. If you add the oils too soon, they will burn off and the wax melts won't be as strong. Pour into wax melt molds. Let cool completely. Wait 24 hours before using so they have time to cure. When you go outside, pop a wax melt into your tart burner and light a tea light underneath it. The wax will melt, and the essential oils will give off their scent, deterring the pests. I wish I could say that this repels 100 percent of flying pests, but nothing will do that. It does greatly reduce them to where they don't both us at all. I will still get an occasional bite, but that's better than being almost eaten alive by the little buggers. If you do get bit, try my DIY Itch Relief Solid Lotion Recipe. If you're not ready to DIY this homemade bug repellent candle melt recipe just yet, there are several bug repellent candles on Etsy. Or try one of these essential oil bug sprays on Amazon.